The Semillon for this wine was hand-harvested from some of the South Burnett’s oldest and highly-acclaimed grape vines, grown on the dependable Barambah Wines vineyard. 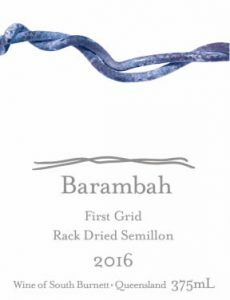 This wine- from an outstanding 2012 vintage- was made from hand-harvested portions of Semillon grapes, dried for five weeks on racks of Barambah’s design. Using the company’s special techniques, the grapes we re-fermented with dry Semillon wine, and aged in French hogshead oak. The balanced sweetness and full-bodied sweet wine flavours of this ancient style and high-quality hallmarks of this mature Barambah Wines vineyard.